Knowing when to water and how is important for proper tree growth and fruit production. This plum tree may last another year, but will die in the future. Knowing when, and how much, to water or irrigate fruit trees is very important for maintaining proper growth and fruit production. Without adequate soil moisture, trees will not grow and thrive and, even on well-established trees, fruit production can be impaired by drought and moisture stress. 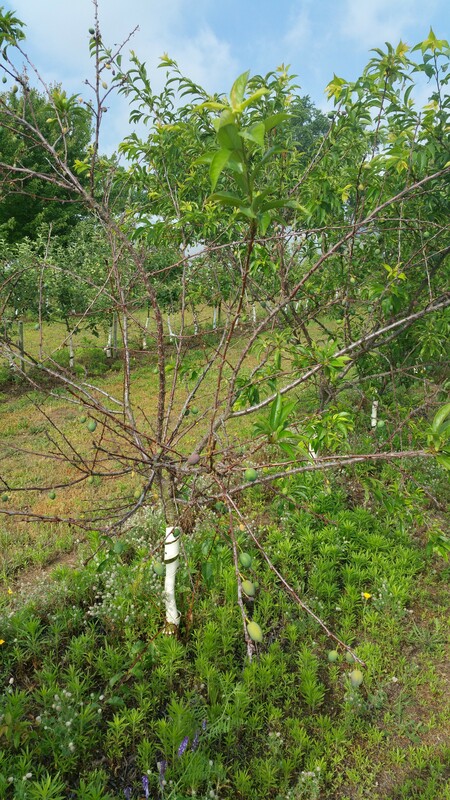 While there is no “magic number” of gallons or inches of water to apply to fruit trees, there are some rules of thumb and old-timers guidance that will help. 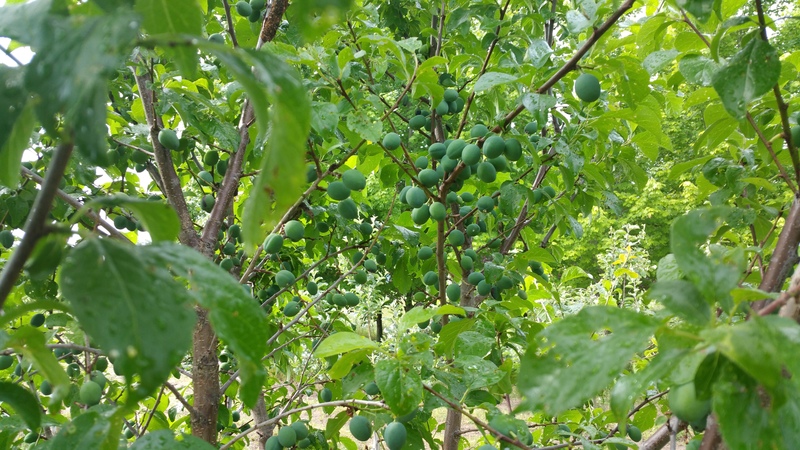 All fruit trees, no matter their age, need an adequate amount of soil moisture to properly grow and thrive, and to produce and carry a crop of fruit from the tree to your table. Tree age is one of the major points of consideration, as trees of different ages require different moisture levels. Also, the tree will “talk” to you through different growth signs that you should be on the lookout for daily. Tree age: Tree age is one of the most important factors to consider when determining how much water the tree needs. Newly planted trees are the most “needy” in that they do not have established roots yet, and their ability to take up moisture is very limited until major root growth happens and the ability of those roots to take up moisture outpaces the new growth of foliage and shoots. Please check your newly planted bare root trees at least weekly, even if you think you have had adequate rainfall. It is easy to be fooled by a little rain. Just because your pavement is completely wet, doesn’t mean that your trees received as much rain as it looks. A good rain gauge is a valuable tool to have. Grandpa figures that a “good rain” that helps his trees is at least a quarter of an inch of rainfall or more, while anything less often just isn’t of much use, unless it happens for several days in a row. A sprinkle of rain just makes Grandpa’s dusty pickup look spotty and doesn’t help the trees a nickel’s worth! The soil around newly-planted trees should always be moist. 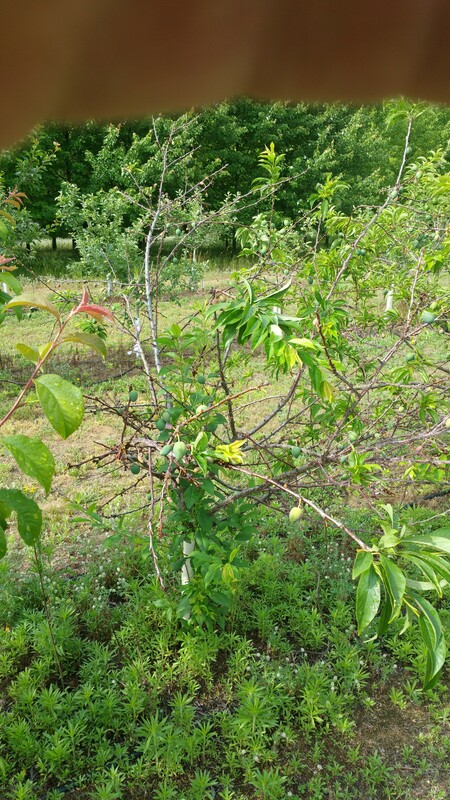 Some customers plant trees in the “wilderness” to have future fruit for the critters, and some plant them on properties away from home where they wish eventually to move. Often these trees just don’t get adequate moisture during their important first seasons because the customer isn’t there to observe them and water them when they need it. It is a good idea to visit them often or have a neighbor look at them often and water them for you. One- to three-year old trees, while they have more established roots, are still in need of adequate moisture and cannot survive major drought or water stress as well as older trees. These are the trees that will normally “talk” to you earlier in the season when they are under moisture stress. Wilting of leaves is the easiest symptom to observe, but its causes may not always be due to lack of water. We will discuss this later. Well established trees will have expansive root systems that typically go out to what is called the “drip line”, which is the area under the tree canopy and the circumference of it. Once a tree has an expansive root system, it will survive drought conditions, as well as occasional flooding, much better. Still, if there is a big crop of fruit set on the tree, it is important to maintain adequate soil moisture to bring that crop to maturity. 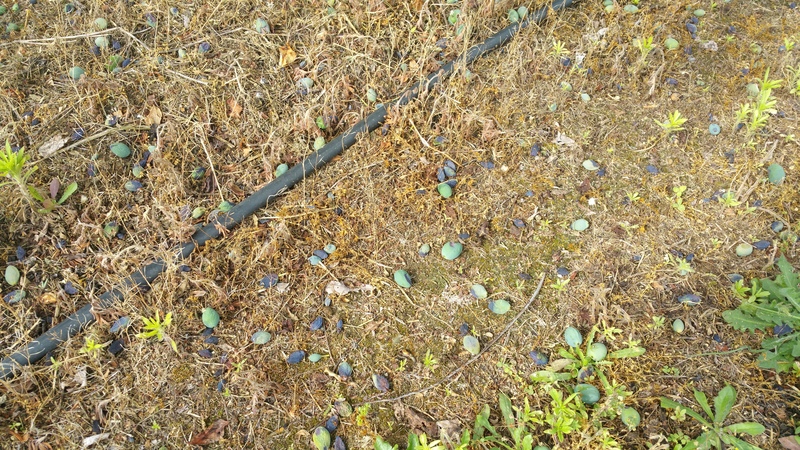 Lack of adequate moisture can result in small fruit, fruit drop, or delayed injury the following year. Some rootstocks will use available water in drought-stressed years to produce a crop at the sacrifice of tree growth and health, thus in a sense choosing “suicide” the following year over the possible death of their “children” (the fruit which has a seed in it) this season. Wilting is always a symptom of “something”! Most often people believe wilting of the leaves is a sign that the plant or tree lacks sufficient moisture. In most cases, this is true and can be easily checked for by examining the soil around the roots. If it is dry, then the wilting is usually caused by the lack of moisture. Immediate watering is usually the best cure. Don’t expect the tree to immediately “perk up”, as it can take several hours for the tree to absorb the moisture and transport it to the leaves. Usually though, by the next day, you should see improvement, if you watered enough, but you should still recheck and may have to water again to make sure the soil profile has become adequately moist. There are other common causes of wilt that should be checked for and eliminated. Many people wonder why the fruit is dropping off. The reason is usually because there is either too much (this case) or poor pollination. Usually a little of both happens. This looks like a lot of fruit, but the next picture will show the nice crop that is left on the tree still. Over-watering or flooding! Surprisingly, too much water can cause the leaves to wilt. Usually, this is caused by the lack oxygen to the root system that is trying to survive in a saturated soil. Younger trees are more susceptible to flooding than older ones. Newly planted trees that are flooded for more than a few days may just not start to grow. Young trees that seem to have started growing well and then get flooded, can withstand a day or so of flooding, but long periods can result in tree death. Old trees with extensive root systems seem to take flooding better, but root diseases may start up. Daily water stress caused by hot temperatures or hot, dry winds. One kind of wilt you might often see on new or younger trees is “flagging” of leaves and shoots; this is caused by high temperatures during the day or hot, drying winds. In these cases, the trees might well have more than adequate soil moisture, but the roots just can’t keep up with the demands of the leaves and shoots for moisture, and so there is a temporary wilting visible. Usually, in these cases, you should see improvement over-night and, by the next morning, the trees will often look fine. If it is persistent the next morning, check the moisture level of the soil to make sure the soil is adequately damp. This kind of wilting is definitely related to weather conditions, so during the high temperature months and windy, dry conditions, make sure to maintain adequate soil moisture by irrigating more than you would in more normal weather conditions. Unless it is really severe, this temporary wilting is usually not harmful or permanent. Over-fertilizing: The excessive use of a dry granular fertilizer applied too close to the root system of younger trees can sometimes cause root system burn or damage, and the tree may show wilting signs. Usually, this can happen after the application is made and a rain dissolves the fertilizer and takes if down into the shallower feeder roots. An excessive application of fertilizer that is carried down by rain is like watering your trees with salty sea water – permanent damage can result and possible tree death. If you think your tree is wilting because of this, the only real damage control is to try to water heavily and continue to leach the fertilizer out and under the tree root zone. If you are fertilizing using soluble fertilizer, please follow the label directions as it is possible to overdose this way also. Winter damage: One cause of wilt that often surprises backyard growers is the wilt caused by winter damage. Here are two. The one with severe damage set a crop, but now the tree is dying—it truly is a “goner”. Often, when the first hot spell comes, a winter-damaged tree will start to die. This is because the tissues in the trunk responsible for moisture transportation up and down the tree have been severely damaged by cold events, last fall or winter. All of a sudden, the tree will just start to collapse and the leaves wilt. Sometimes, this will often happen after a “beautiful” crop of fruit seems to be set on the tree, but the demands of the crop and foliage become more than the damaged transport system can handle, the tree will start to drop the crop and limbs will often start to die. There isn’t too much one can do to help in these situations as, once severe winter damage occurs, the tree will eventually die. Lesser winter damage may result in just lost limbs. How much to water? As I said before, there is no magic number, but there are some tools to use that will help. Unless you are a “watering fool”, it is pretty hard to over water trees as a backyard grower, unless you leave the sprinkler on for days or Mother Nature gives you a flood. Under-watering or just plain forgetting to water young trees is often the easiest mistake to make. The “clumping test” is one of the easiest ways to tell if your soil is adequately moist. Grab a handful of soil from between the trunk and the drip line and squeeze it in your fist. If it clumps up into a ball and maintains its integrity after you open your hand, then there should be adequate moisture for growth. If it clumps and breaks up, you should probably irrigate a little. If it clumps, and you squeeze out moisture, you can hold off of irrigating. If it doesn’t clump at all, and seems desert dry, then you seriously need to irrigate. This is an easy test that should work on most soil types. It works best with sandy and gravely soils that tend to not want to hold a lot of moisture. Clay and silty soils will tend to clump easier because of the clay content, so observe how moist the soil clump looks. Moisture meters are also available that can help determine soil moisture content. These are more expensive tools that professional commercial orchardists often use in conjunction with their irrigation systems.